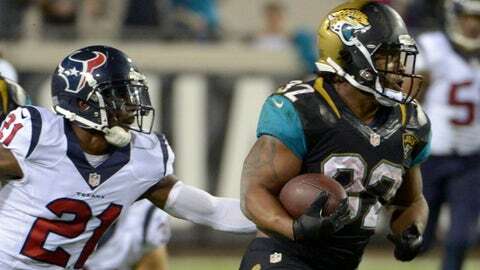 Maurice Jones-Drew was sidelined last week with a hamstring injury. JACKSONVILLE, Fla. (AP) — Jacksonville Jaguars running back Maurice Jones-Drew is active and starting against Tennessee. Jones-Drew has been listed as questionable for Sunday’s game with a hamstring injury, which kept him out of last week’s loss to Buffalo. Linebacker Geno Hayes (knee) and defensive tackle Roy Miller (shoulder) are among Jacksonville’s seven inactives. Both had been questionable. Linebacker J.T. Thomas and defensive tackle Brandon Deaderick will start in their places. The Titans are without starting right tackle David Stewart, sidelined with a shoulder injury. Byron Stingily will start in Stewart’s place. Receiver Kenny Britt, cornerback Khalid Wooten, linebacker Zaviar Gooden, offensive lineman Kevin Matthews and defensive end Lavar Edwards also are inactive for Tennessee.